We are the Gothic Archies, death, tentacles, and pip. Took longer than I expected to get to a Stephin Merritt project. The Gothic Archies is Merritt’s project of depressing bubblegum pop. 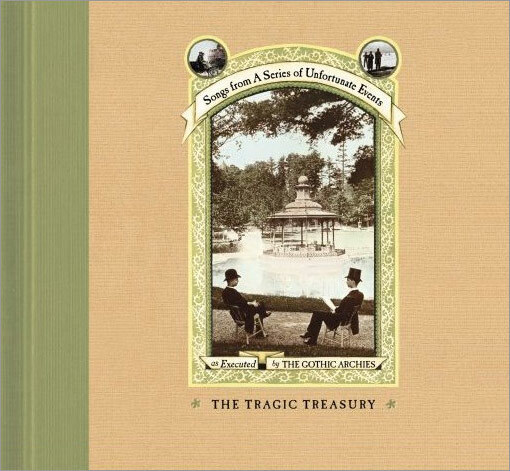 The Tragic Treasury is a collection of songs created by The Gothic Archies for the young adult novels A Series of Unfortunate Events. Each audio book in the series began with a song by The Gothic Archies. Of the fifteen songs, thirteen were previously released on audio books. The other two include a song introducing the band aptly titled “We Are The Gothic Archies.” The other was an alternative song for one of the books. You could count it as a comedic record if you want. I guess in many ways it is. While the lyrics are often humorous, it’s mostly just great music. Merritt is a master songwriter and it shows most when he has a theme, no matter how loose, to play with. Whether he’s writing 69 Love Songs, a record about the open road The Charm Of The Highway Strip, Eternal Youth, or songs beginning with the letter i. The opening track “Scream And Run Away” is a perfect song about the book, but it’s actually a really fun and awesome song altogether. “Scream, scream, scream and run away. Run run run run run run run run or die die die die die die die die die die die.” These books are for children? “Shipwrecked,” the song from the last book is probably my favourite. The tale of a man who purposely kills a boat’s crew to leave him and his love shipwrecked together… again. “Dreary, Dreary” and “This Abyss” are amongst the tracks I would most regularly skip on this album. They’re a bit too slow and plodding.